The Vilano Aluminum Road Bike 21 Speed Shimano is a great option for cyclists looking for a cost friendly but sturdy bike for road use. This is a good quality bike that offers a comfortable ride for your daily trips to work or even for fun rides. As this Vilano Aluminum Road Bike 21 Speed Shimano review intends to show, this is a reliable bike that is perfect for everyday use and a good bargain. 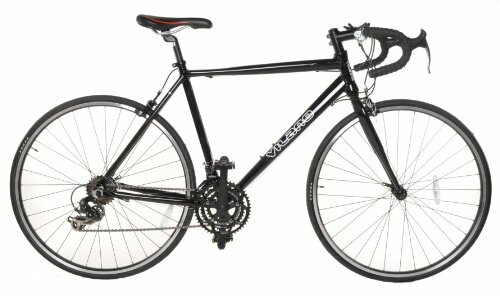 The Vilano Aluminum Road Bike 21 has a sturdy frame made from 6061 Double Butted Aluminum. The frame has two excellent qualities as it is strong and lightweight. It allows you to carry it around easily. Besides, the light weight allows the rider to accelerate speed easily even uphill. The overall look of the frame is also attractive with great detail that includes a well-painted finish. You wouldn’t tell that this bike has any cables because they have been concealed so well and has very neat taps for the handlebar. It has a comfort bike seat whose size has been designed to create a good bike balance in the dimensions of the entire frame. Riders starting off their riding passion with this bike will find the aluminum fork to be a very friendly feature. It is easy to assemble and you can do it all by yourself. Being lightweight, the aluminum fork allows for an easy and smooth ride. The one thing riders look for in the best road bike is the shifters. You have to constantly use the shifters and they have to be quality to withstand the constant engagement. The Vilano Aluminum Road Bike 21 has been equipped with thumb rear indexed 7-speed and front friction 3-speed shifters. They are easily accessible and adjustable to allow the rider to effortlessly control speed as they ride through different terrain. With good quality and reliable shifters such as the ones on this bike, you can adjust from a smooth road to a rough terrain, downhill and uphill without worrying that the shifters will get damaged. The Vilano Aluminum Road Bike 21 is powered by a 21-speed Shimano system. The smooth system allows you to shift the gear freely depending on the speed you want to achieve. Similarly, you can easily slow your speed. The braking system is also safe and reliable allowing you to come to a halt fast even when on high speed. Such a reliable braking system assures you of safety especially when you have to avoid colliding with any obstacles in your path. Riders often choose bike colors that match their personality. The color of a bike is one of the important features that some riders consider. The Vilano Aluminum Road Bike 21 Speed Shimano has three color options that include black, white and grey. Black is more of the traditional color associated with many bikes but riders who want to go a little bit out of the ordinary can choose white or grey. The bike is available in small, medium and large sizes measuring 50cm, 54cm and 58cm respectively. The Vilano Aluminum Road Bike 21 Speed Shimano is an excellent choice if you are looking for an affordable bike with great features. Besides, this is a good quality bike designed to withstand everyday commute. Its durability and comfort give an absolute value for money. One of the amazing things about this beginners bike is that you can customize it to suit your preferences. You can easily change parts from the wheels to the brake pads and literally every part as you would like. You may do it immediately after buying or wait until you have used it for a while to give it a new look. This bike is easy to maintain and it offers smooth and enjoyable rides.